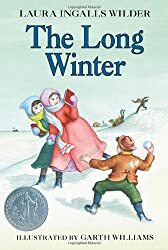 As the title says, this book was just about one long winter. It is the most boring of the books so far. It’s just blizzard after blizzard and the belated Christmas scene at the end did save it for me. Almanzo features again for the first time since Farmer Boy. I found the switching of narratives not seamless and a bit clunky. I did enjoy how every time the Wilder boys were mentioned, pancakes were featured! Mary continues to be a sanctimonious wet blanket while Laura is still a relatable protagonist. I listened to half of this in audiobook from HarperCollins. I got use to the narrator after awhile. She made the singing more bearable too, but there is too much singing in these books. Reread September 12-14 on audiobook and Kindle. Good to see you are hanging with the Wilder series and reporting back. I’m sure feeling about these books would change over a life time. Cheers. They have definitely changed, and I am back to finishing the series. Thanks for the comment, Susan!